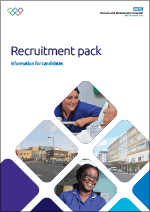 This is an exciting time to join a modern flagship NHS Hospital. We are one of the highest performing major London acute hospitals—we have received excellent Friends & Family patient feedback about our service and have performed well against the national CQIs. On the day you'll have the chance to meet various members of the team, explore opportunities available to you and find out why we're proud to care. We'll also be holding interviews on the day—meaning you could even walk away with a job offer.